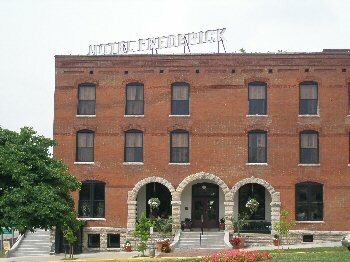 Directions: From Katy Trail, Hotel Fredrick is at the foot of the MO-40 Bridge crossing Missouri River into Boonville. From Interstate 70, take Boonville Exit # 102. Take Main Street approx 12 blocks. The Frederick Hotel is on the right side just before crossing Missouri River on MO-40 Bridge. We did not stay at this hotel but walked down from our bed and breakfast to eat supper. We all tried different dishes but sampled each other’s. The catfish was the best catfish ever. All the dishes were awesome. The chef is very talented with layering flavor. The hotel manager gave us a private tour of different rooms. Then we went downstairs to the bar with live music. We are planning to come back to bring the whole family. I would highly recommend for the hotel, restaurant and entertainment. Have made 8 trips from Clinton to St Charles and have stayed at the Fred during 7 of those trips. It's a great place to stay. Love watch the sun set over the river while dining on the veranda. We loved this historic hotel! It is quaint and lovely. After riding 42 miles on the Katy Trail that day, we easily biked to this hotel and were able to relax instantly. They had a place for us to store our bikes and our rooms were spacious and comfortable. The lady behind the desk was so sweet and accommodating. The hotel is unique with much character. The continental breakfast was fortifying for our second day 40 mile ride. We would LOVE to stay here again! Nice historic hotel. They are remodeling a room for bike repair and supplies on the ground floor. Staff was friendly and helpful. Breakfast included. The restaurant wasn't open on Monday, but Maggie's Bar and Grill within easy walking distance. Trail immediately outside. A great place to stay right off the trail. Plenty of places in walking distance to eat including one at the hotel. They will store your bikes for you too. It's an older building with lots of character. thank you for the recommendation! I will be riding the Katy Trail in September. I booked a room at the Frederick because it is conveniently located. It is nice to know I will have a good experience. Be sure to ask to see one of the rooms with the glass-enclosed bathrooms, even if you don't choose to stay in one. You have to be REALLY comfortable with your roomie to stay in one of those rooms. Google Images you can give the full picture. Definitely the place to stay in Boonville. Right in downtown within walking distance to area shopping, supplies and restaurants. Very friendly staff. Right at the foot of the bridge. Stayed Saturday night, Oct. 17. Great place to stay while doing the Katy Trail. Covered, locked storage for my bike, and a great little bar and restaurant in hotel. Rooms were up-to-date, yet keeping the charm of an older hotel. If you a chance, go to Maggies for a burger/brew. One of the best burgers I've had in a long time. The fall colors on the trail were spectular! We also stayed there recently and it was our favorite room on the 5-day trek. Even if you don't overnight, check out their lobby: the restrooms have clean rolled washcloths perfect for gritty faces, plus a water dispenser, a handy computer, and the friendly staff is VERY welcoming to cyclists. The cute young dining room manager made my day when he said he could only do 11 miles on the Katy before calling someone to pick him up...made an older lady feel so strong! What a fabulous historic hotel in a great location right on the trail - spacious rooms, updated bathrooms, bike storage, friendly staff, and a continental breakfast (ours included fruit, boiled eggs, and cinnamon rolls...yum!). We didn't get a chance to eat at the restaurant, because it was closed on Monday, but we will definitely be back. Staying here has been one of the highlights of our tour. Great hotel! It is a grand hotel. We've stayed there many times and enjoy it each time as if it were our first stay. To my knowledge, it was a firm in Kansas City that did the renovation. The Bothwell in Sedalia is another grand old hotel that is worth your visit. It is just a few blocks from the Katy and has a nice restaurant also. Agree with above. Also, don't miss the restaurant at Hotel Frederick. I stopped there a couple weeks ago and had a wonderful shrimp poor-boy sandwich, tomato basil bisque soup, and salad with "Dueling Berry" dressing that is literally the best salad dressing I have ever had. All for about $15. Not putting down anyone else, but why go elsewhere when you can have chef made food at a very reasonable price? PROs: spacious rooms (can keep bikes in there). CONs: a/c and jet tub didn't work. Ice available through kitchen downstairs. Offer protein at breakfast in the form of boiled eggs--important for bikers! Is the Hotel Frederick restaurant open to public or just guests? Are they (smelly) biker friendly? Beautiful, historic hotel, lovingly restored. Charming facility, with every modern convenience one could ever expect. The staff went out of their way to make our stay a good one. Very good on-site restaurant. Six of us stayed in room 9 and it was fantastic. The layout of the room gave us all some privacy and we enjoyed the ambiance very much. I had rode my bike passes the hotel two times before but I'm very glad it worked out to stay on this trip. The continental breakfast was very good, and everyone was very friendly! I will finitely be coming back. We stayed here on our first night traveling from Sedalia to St. Charles on September 15, 2014. This was an amazing hotel experience. The room we stayed in was room #1 and it was awesome! Although it is a historic hotel, the rooms are modernized and beautiful. Since we got there late, most of the town had shut down so we were told the lounge will also serve food. We decided to go there and the menu was more like a tapas style menu. We were skeptical, but pleasantly surprised. The food was great. We had the peasant platter which was an assortment of meats, cheese and fruit...a lot of food for the money. The staff at the lounge and also the desk were friendly and accommodating. They stored our bikes in the basement which was locked. We would highly recommend staying here! We stayed at the Hotel Frederick the evening of October 16, 2013. This classic hotel has been extremely well restored and was a pleasurable place to stay the first night of our Katy Trail ride. The room was very comfortable. The hotel is conveniently located to the trail and they had a secure place in the basement to lock up our bikes overnight. We would definitely recommend this hotel as a place to stay for anyone riding on the Katy Trail. This hotel was very neat and well restored. Great jetted bath tub in the Queen Suite, nice breakfast, great common areas, good restaurant. We only had one hiccup. One of the service staff (Lynn at front desk) handled guest needs poorly. We asked to get our bikes out of a locked storage in basement. She acted like we were putting her out. She grabbed the keys, sighed, and waited impatiently while we got our bikes. It wasn't like she was busy at that time, it just appeared to be a huge bother for her to help us. Then another person in our party bought several items from gift shop area. When the guest asked for a bag to put her items in, Lynn refused saying "I don't have a bag. Then the guest asked for something to wrap her 5 items. Lynn gave her one piece of paper to wrap them in, the guest asked "Can I have more wrapping paper, Lynn said no. The guest said "I don't want to purchase the items then". Then Lynn gave her additional wrapping paper. Once again, Lynn wasn't busy, she just didn't seem to want to be helpful at all. Wonderful place to stay before starting the Katy trail or just relax on vacation. The place is beautifully done to give you that historic feel. The Bar area was comfy and very inviting. Cant wait to return for a weekend stay. I stayed here on one of my nights of a week-long Katy Trail trip, and it was, by far, my favorite place. It was beautiful restored, elegant, and comfortable. My meal at Glenn's Cafe was delicious. Everyone was friendly, and my bike was very securely stored in the basement. You pay a little more for a night here, but you get what you pay for. I can't wait to stay here again. Have stayed here twice. Once riding the trail and once passing through town. Fantastic experience both times. Glen's Cafe, the hotel restaurant, is wonderful. The continental breakfast is nicely appointed for fueling your ride as well. They even left it up for us so we could eat on return from a run on the trail. Hotel lounge is nice for a post ride drink as well. I think you'd be hard pressed to find a better option for lodging on the trail. If you spoil yourself once on the trail, do it here! Stayed at Hotel Frederick back in October while doing the portion of the Katy trail from Clinton to New Jefferson. The Hotel was great! The people were great! Don't forget to ask for the Katy Trail discount. Me and a buddy recently finished the entire Katy Trail from Clinton to St Charles. Our first day covered the distance from Clinton to Boonville, and we made arrangements to stay at the Hotel Frederick. This place was great, and the service was excellent. They had all the amenities of a major hotel, but the customer service of a small bed and breakfast. The staff eagerly served us from bike storage, getting us ice, and just making sure we were comfortable. A very historical hotel, I would recommend this place to anyone. We had a leisurely trip from Clinton to St. Charles in July 2008, staying at six hotels and B&B's along the way. One was just barely adequate, most were excellent, but this place was awesome, our hands-down favorite! The restoration is magnificent -- in the rooms (each of which is unique - ask for a tour), the public areas, and the dining room, too. Even the bike storage room is a trip into history. Apparently, the two men who bought the hotel in 2003(?) and restored it were graduates of the Kansas City Art Institute. Their work is a tribute to them and to their school. Stay here if you can! Very nicely renovated historic hotel. Extremely friendly staff, who stored our bikes in a room locked room on the first floor. The rooms were comfy with neat glass tiled shower bath. Would highly recommend. This place is a MUST. The staff catered to us, and to our bicycles (we were riding the Katy Trail). The room was one of simple elegance with an historic feel to it. I highly recommend it! The staff at the Hotel Frederick could not be more friendly and helpful. The hotel itself is a pleasant step back in time.....our compliments to the owner on the renovation. The combination of Glens's Cafe and the hotel is something that Boonville should be well proud of. Job well done! We checked in on Saturday of Labor Day weekend and had the pleasure of dining at Glenn's that evening. Early the next morning we hit the trail for an out and back century ride. As we arrived back at the hotel that evening, we were greeted with doors opened for us to the hotel and to the bike storage room. Soon to follow we were each given a cold bottle of water. That treatment is a far cry from the staff at Hotel Bothwell in Sedalia last June laughing when I had to ride my bike down the street to go buy a corkscrew because one of their prior guests had stolen theirs and they just hadn't gotten around to replacing it yet. I would have expected an apology because they couldn't produce a common bar type item for a guest, instead of being laughed at because I had to buy one. We can say that we've stayed at Hotel Bothwell....but we'll be returning to the Hotel Frederick. How cool can a hotel get! The rooms are awesome! I've never seen a bathroom like the one we had in our room...glass walls! But even for as sharp and chic as it was..it was still very comfy and welcoming.And the view was amazing! I totally recommend this hotel.It's rare to find sometihng this stylish with all the history and an awesome bar/eatery attached. I'm totally going back there! agreed! We stayed there on Aug 7th. It was so convenient to be right downtown, near the river and restaurants. Great towels and soaps and a safe place to store the bikes. They let us hose off our bikes on the sidewalk outside the hotel. Wow! I'm a biker, and after seeing the reveiws on here, I stayed there! It was great being so close to the Katy Trail! The rooms were the nicest I'v seen in a motel/hotel! My wife loves the colors of the towels, and sheets. She is sick of the traditional white! We also liked having someone carry our luggage to our room after being tired from a long drive.